Above: Northam Vertue in California. Northam Vertue V147 was built in the late 1960’s at a time when around fifteen teak built vertues had been imported from Hong Kong. These Cheoy Lee boats nearly all had the ‘long doghouse’ layout, with a pair of windows, but her builder, Gary Kemp, clearly wanted an equally high quality specification but with the longer, lower ‘ocean coachroof’ design. This design had already been illustrated in the appendix of Humphrey Barton’s book about his Atlantic crossing with Vertue XXXV and Kevin O’Riorden, and must have been drawn partly as a result of the damage caused to her on that passage. Of course this low, stepped, coachroof and similar internal layout had also already been tried in the Hiscock’s Wanderer III which was launched the following year, and the profile of an ‘Ocean Vertue’ closely resembles a miniature version of their boat. 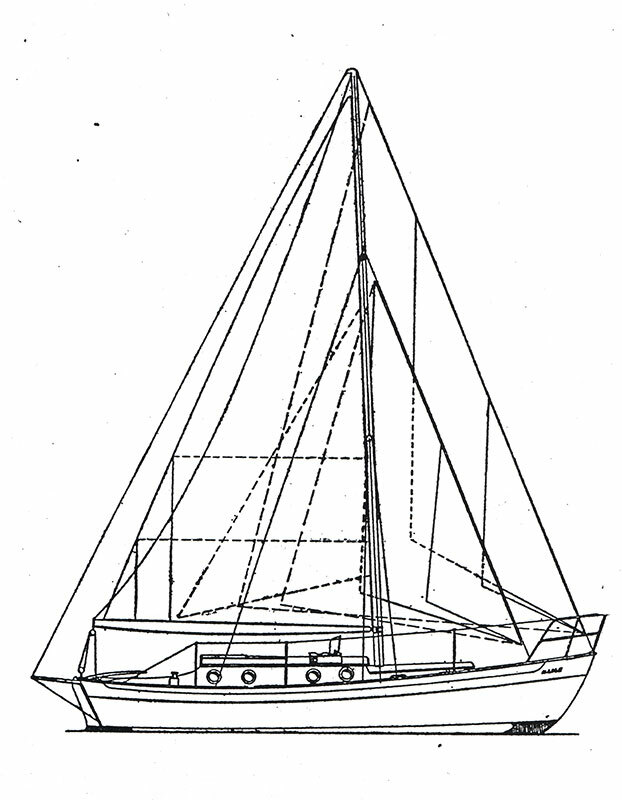 Strangely enough, the rig illustrated showed a cutter rig even though Wanderer III had the combined ‘masthead sloop with inner forestay’ foretriangle arrangement used by most vertues. 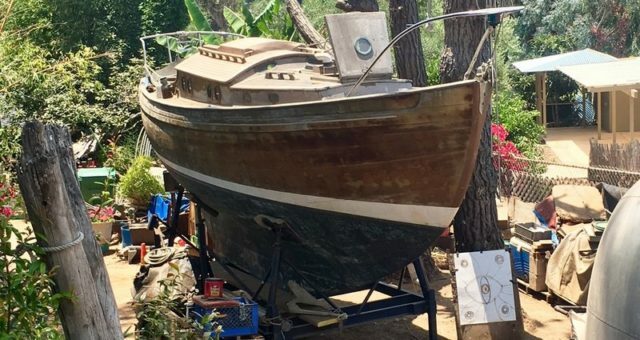 It would be great to hear from Gary Kemp himself if he reads this, and it does look as if his beautiful boat is now about to have a new lease of life! Some of you will remember that two other ‘ocean vertues’ Icebird and Mea have both been on the market in the UK for some time now and both are shown in previous Newsletters. Mea was built by Cheoy Lee in 1959 and sailed by her new owner back to the UK, following in the footsteps of Peter Hamilton with Speedwell of Hong Kong. Icebird completed an ‘atlantic circuit’ whilst in the ownership of Dr. Cunningham who completed this voyage singlehanded, and declared that the boat sailed herself most of the way back from the West Indies before the days of any kind of self-steering gears. Meanwhile, I am delighted to report that further north on the west coast of America, Marguerite of Poole has recently been bought by another keen shipwright who intends to restore her. 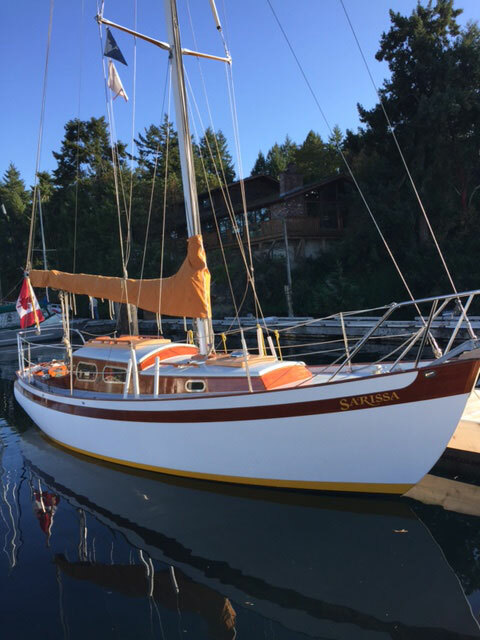 As I reported in May she had fallen on hard times as her owner Brodie Pederson had been trying to find a good home for her, having earlier bought her from Gerry Toward, the owner of the beautiful Giles boat Kalliste. Marguerite’s new owner is Matt Smith and he is already in touch with Nina Jackson, the daughter of the boat’s first owner. He is planning to work on in the yard in West Vancouver and Brodie tells me that he has the full support of everyone there. No one knows if the boat was sailed out to the Pacific Northwest on her own bottom or whether she was shipped out from England. Is there another tale to tell here? Marguerite is one of the very first post war Vertues to be built with a doghouse. The resulting boat, Sarissa, looks immaculate and I hope to be able to show more photographs of her in the future. 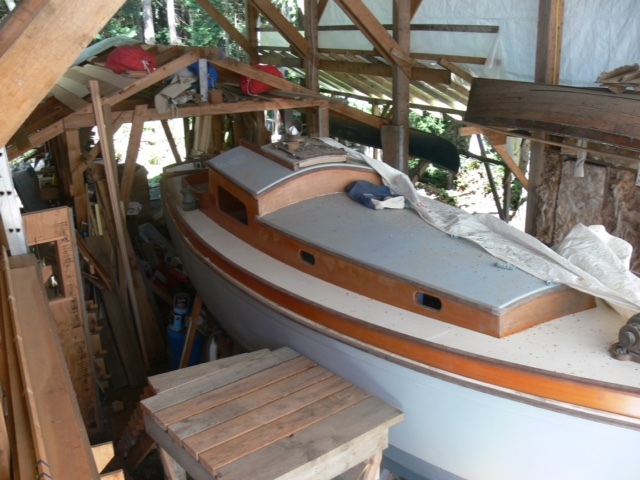 Meanwhile Glenn Brooks has been in touch to report that Kukri, V74, has been having a long rebuild on Gabriola Island, north of Victoria, B.C, and here is a picture of her in the shed. Kukri being restored near Victoria, British Columbia. Whilst Sarissa has the shape and dimensions of the earlier ‘Mk I’ vertue, she has been constructed using cedar and mahogany with modern glues, laminations and cold moulding techniques. Of course this ‘Mk I’ shape had already been modified from the original Andrillot design by raising the freeboard and adding a doghouse and longer coachroof, to provide more space below. 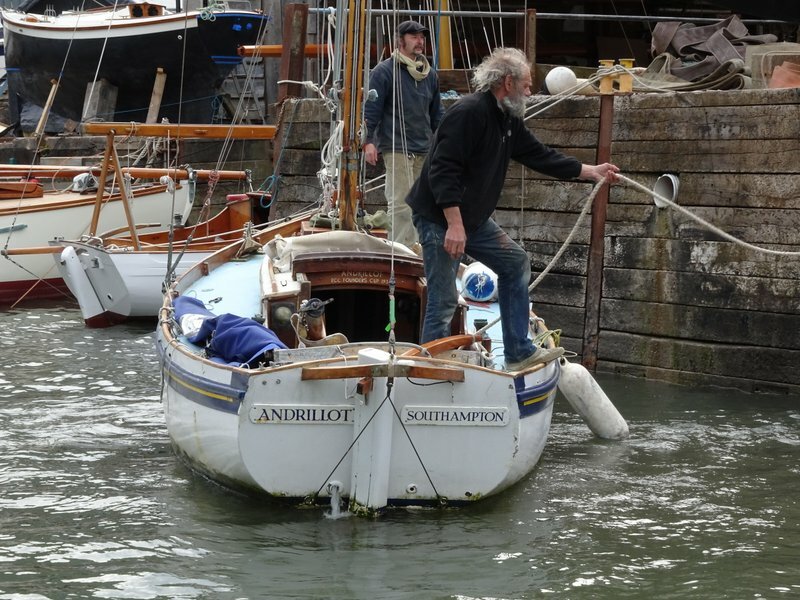 Andrillot is currently undergoing a major refit here on the River Dart, including the replacement of her later extended coachroof to enable greater space and headroom below. It is not what I would do to the very first Vertue, but then heaven forbid that our boats become so over-precious that an owner no longer has the liberty to do what he will with his own boat! Andrillot about to be lifted out for a refit, with Caupona beyond. The ‘Mk II’ vertue design was partly conceived to accommodate the extra weight of grp construction, introduced in 1979. (The first grp boat, Vertue Voyager now sails out of Gothenberg and is kept in beautiful condition by her owner Tom Evers. I am only using the ‘Mk I and II’ designations very loosely here and don’t really advocate their use universally, as the development of the Vertue design is slightly more involved than this.) The beam and draft were increased by a few inches, but the main difference was in the amount of freeboard these later boats were given. 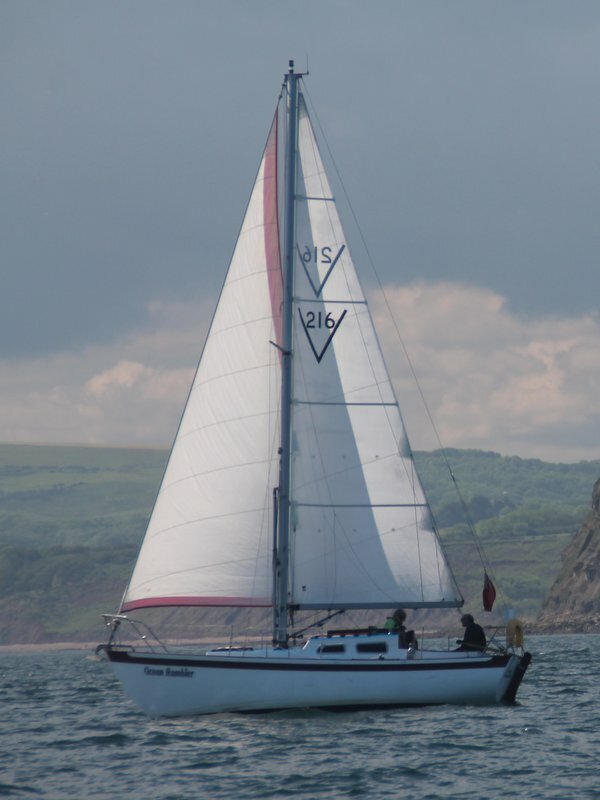 The extent of this was made apparent to me recently when John Anderson kindly sent us an update and photos of his boat Ocean Rambler, V 216, sailing off her home port of Whitby. Ocean Rambler sailing off Whitby. Here it can be seen that the much higher, modern, freeboard allows the doghouse and coachroof to be reduced in height, giving the boat quite a different appearance in profile from the Vertues of fifty years ago. The sheer has also clearly been flattened, and with the rig reduced to a simple, single-spreader, masthead sloop the latest, streamlined Vertue is clearly a 21st century cruising boat. Ocean Rambler was built by Consort Yachts in Kent and delivered in 1994. John bought the boat several years ago and set about a major refit before deciding to keep her in Whitby. 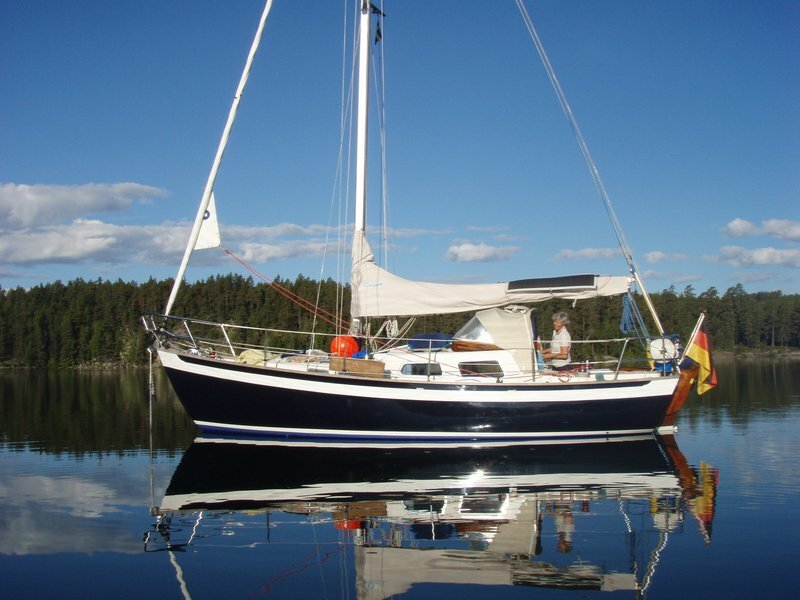 Finally, if you want to buy a really nice grp Vertue, Volker Voss has written to say that his boat Asrama VII 18, is now sadly up for sale, after many years wonderful cruising in the Baltic. Her details can be found under ‘grp Vertue II’s but here is a delightful image to remind us all of the pleasures of cruising.